Although born in Truro, Joseph Carne probably ranks as one one of Penzance's most eminent sons, a man whose days seem to have 48 hours in them, so much does he achieve. Joseph Carne was born on the 17 April 1782 in Truro, the oldest son of William and Anna Carne. In 1797 William Carne went into partnership with Richard Oxnam and John Batten to form Penzance's first bank, initially based in Chapel Street in Penzance. The three men were all general merchants with shipping interests as well as mining investments. 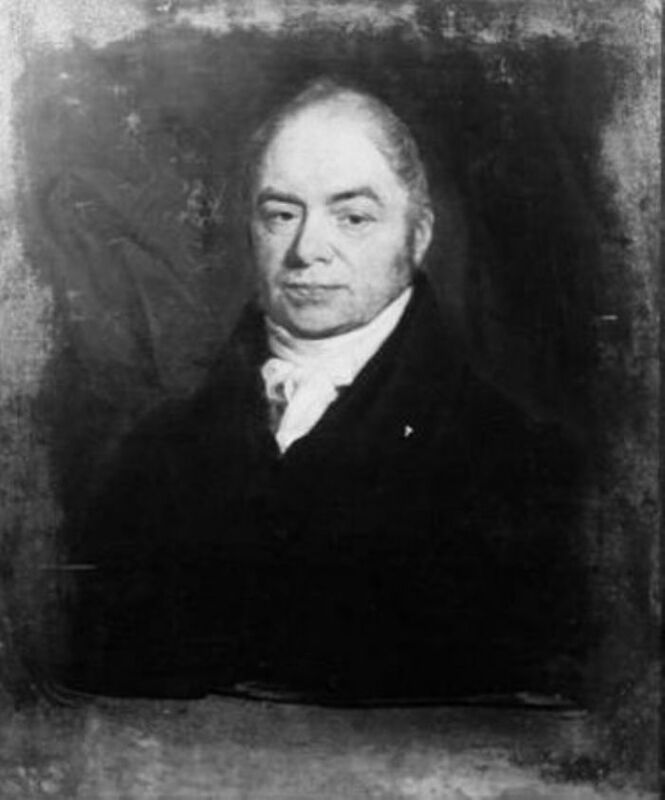 Joseph Carne carried on the family pattern by going into business, becoming the manager of the Cornish Copper Company at Hayle in 1807. Having taken possession of the manager's house, Riviera House, on the seaward side of Copperhouse Pool, Joseph set about establishing a family and married Mary Thomas of Kidwelly, the daughter of a doctor practising near Haverfordwest. Mary and Joseph lived in Riviera House until 1818 when he resigned from his post and took his family to Penzance. They must have enjoyed their time in Riviera House as both of them returned to Phillack to be buried. In 1823 he joined his father's bank as a partner and from then until he died in 1858 he remained in Penzance. In 1841 and 1851 the family were to be found living near the junction of Chapel Street and Abbey Street, not far from the bank. It is after he returns to Penzance that Joseph Carne really starts to come into his own though by then he had already been elected a Fellow of the Royal Society, in May 1818. 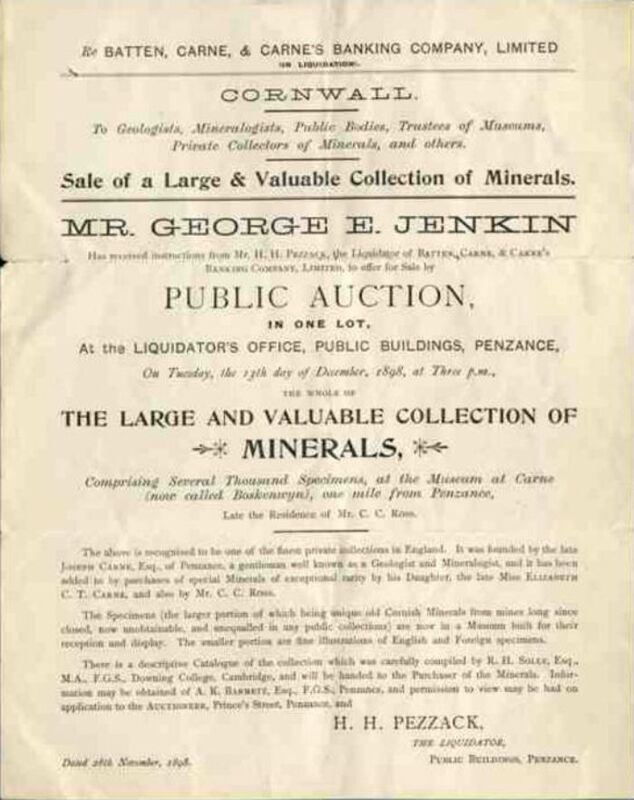 The Royal Cornwall Geological Society had started up in 1814 and he is a stalwart member, one of the first to subscribe and becoming treasurer of the Society for many years. He was one of the select group who welcomed Prince Albert to the Society's rooms when he visited in 1846. Carne's position was not based merely upon the prominence of his family, he was a practising geologist and mineralogist, building a collection of minerals which was eventually acquired by Cambridge University and now forms part of the Sedgwick Museum of Earth Sciences. In 1822 he delivered a paper to the RGSC on the mineralogy of St Just which included a map on the mineralisation of the parish. The paper remains a major source on the mineralogy and mining of the St Just area in the early 19th century and will be covered in a later On This Day sketch. Carne was one of the first to write on the characteristics and intrusion of the granite plutons into the slates and mudstones of the west country. He was in on the birth of a science and made a significant contribution. William Smith's “map that changed the world” had only just been published, in 1815 to be precise, and the science that lay behind it was the genetics of its day. The implications of strata studies were about to turn society upside down by casting huge doubt upon Biblical chronology and, by imputation, the reliability of other aspects of Biblical teaching. Joseph Carne was a devout Wesleyan and you can't help but wonder what he he thought about all this. He was a perceptive man and must have been able to see where his science would lead. But he continued to publish and speak, his subject matter widening with time. In 1846 he spoke on the submarine forest of Mounts Bay and in 1851 he lectured on the discovery of a raised beach in Zennor. He also became the President of the Penzance Natural History and Antiquarian Society. It does seem that once back in Penzance geology and related subjects became his life, not forgetting his Christian Wesleyan faith. Unlike many of his peers his did not become mayor of Penzance and though he was 'pricked' for the office of High Sheriff of Cornwall in 1837 he turned the opportunity down. Serving as a JP seemed to suit his character better and it was an office he held for many years. His peers clearly thought well of him: in 1838 he was a member of a deputation from the Cornish tin industry to visit the Chancellor of the Exchequer, other members included The Earl of Falmouth, Sir Charles Lemon, Pendarves MP, Sir Henry Vivian MP, Davies Gilbert and John Taylor. He was recognised as what might today be called “a mover and shaker” in the industry. Throughout his life he maintained close links with the Wesleyan chapels of west Cornwall, he taught Sunday Schools and supported other teachers. There are many references to Joseph Carne in the Cornish press but possibly the most frequent references do not chart the career of the man but the voyages of the schooner belonging to the Penzance Shipping Co. which was named in his honour in 1837. Family birth and death data and census details are from the Cornwall Online Parish Clerk and the the Cornwall Online Census Project. The image of the poster for the auction of the Carne minerals collection is used with the kind permission of The University of Cambridge, Sedgwick Museum of Earth Sciences, Reference. DDF Box 545.